(feature) Added "Tuning" parameter to modulation section. This enables String to be tuned up or down a half-semitone in either direction from standard concert pitch. Previously saved presets and projects will use A=440Hz by default. (fix: Windows 64-bit VST) Fix for immediate VST crash which could occur on certain hosts when run in Windows XP 64-bit. 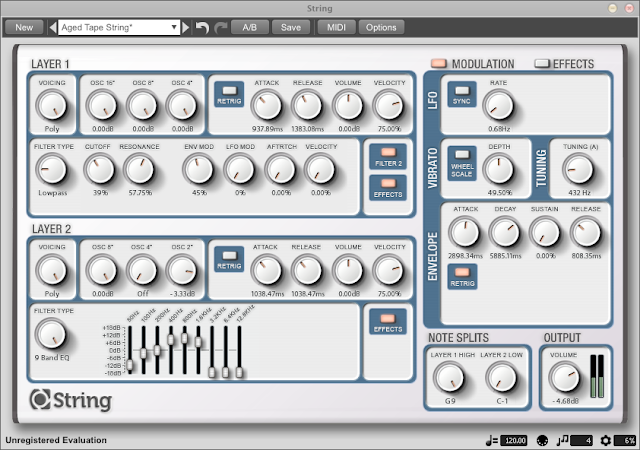 (fix: Mac OS X Audio Unit) Fixed issue which caused Reaper to host new instances of String FX as a mono plug-in.